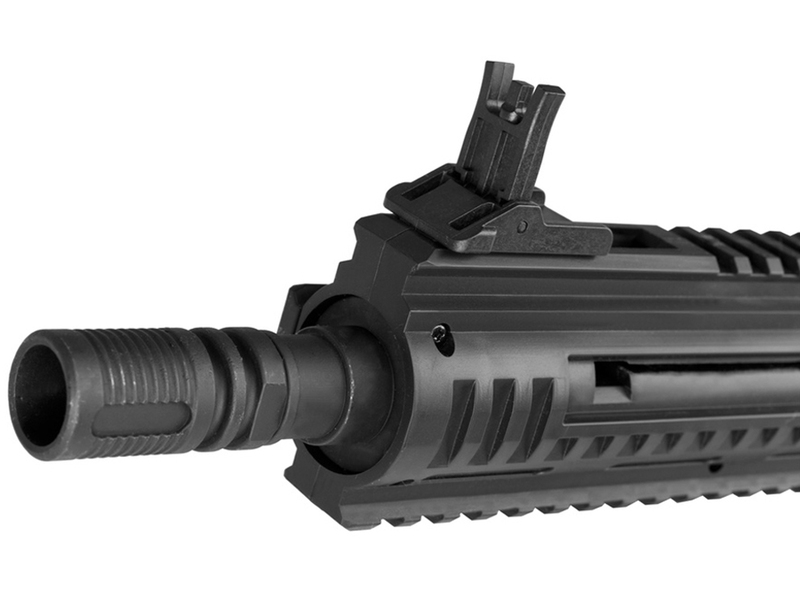 Trigger Pull: The trigger pull on the Umarex Steel Force CO2 BB Machine gun is single action only, so you will need to charge the rifle by pulling back the charging handle first, one this is done the trigger is reset and ready the gun is ready to shoot. 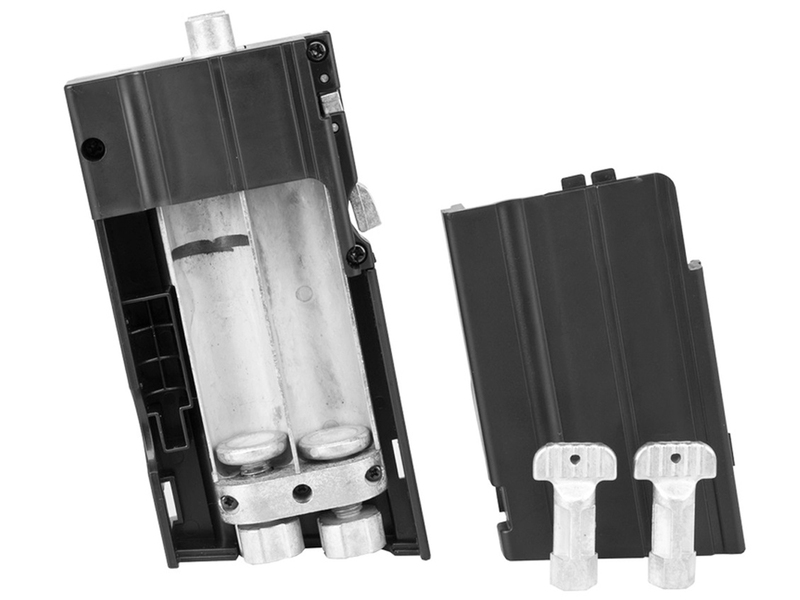 The blowback operation charges the internal bolt automatically afterwards so keep this in mind, to release the bolt you will need to take out the CO2 magazine and press the trigger. The trigger is fairly light but has some initial take up and then a bit of creep before it releases the bolt. Accuracy: I shot the Umarex Steel Force at a target from 30 feet away in a semi rested position using both the semi auto and 6 round burst modes, the Steel Force performed very good getting around a 1.5 inch 10 shot grouping in semi auto and then spreading out a bit in 6 round burst mode which was to be expected, still a respectable grouping. Shots where well centered on the target but I did have the advantage of using a red dot scope, I found when using the none adjustable open sights that come with the Umarex Steel Force that I was shooting under the target at closer ranges. My Chrony testing did not go exactly as planned due to my temperamental Chronograph but I was able to get two shots to read and they average out at 466 fps, well over the 430 claimed fps. Build Quality: The Umarex Steel Force CO2 BB Rifle is mostly plastic on the outside with most of it's metal parts on the inside, you will find a metal flash hider, metal trigger and metal trigger guard but other than that everything else externally is plastic. The plastic seems durable enough but it has just a bit too much shine for me which I think makes it look less like metal and more like plastic. Everything seemed to function as expected but again I would have liked to have seen a bit more metal, not necessarily the outer shell, but I feel the selector switch, sights, magazine release, charging handle and front and back sights could have been made out of metal and would have given this Umarex rifle a bit more weight and balance. 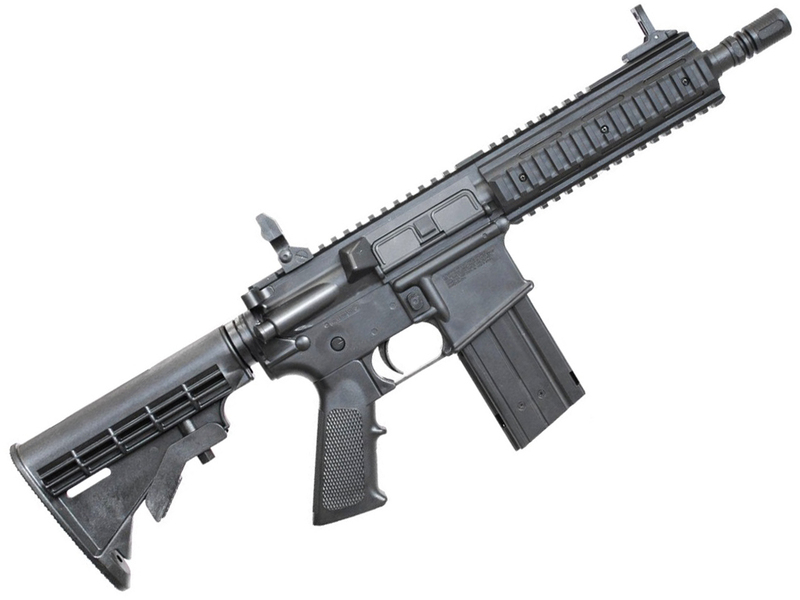 Realism: The Umarex Steel Force CO2 BB Rifle is designed on the AR platform and for the most part is about the right size shape and look of an AR pr M16 rifle. Even the selector switch, magazine release, rear adjustable stock and Charging handle function just like a real AR! Some parts are model in just for looks like the bolt release, dust cover and forward assist but at least they fully look the part. The plastic for me was the real tell here as it kind of looks like plastic where as some plastic guns are really hard to tell they are not metal, but other than that this is a pretty decent replica of an AR Rifle. Good accuracy in both semi and 6 round burst mode. Got lots of shots per dual CO2 (Full Hopper). Love the adjustable AR stock which was missing and needed on the Steel Storm. Price point is good for a fun dull auto BB rifle. Just a bit more metal would have been nice and added to the overall weight a bit: Selector, Magazine Release, Sights, Charging handle. 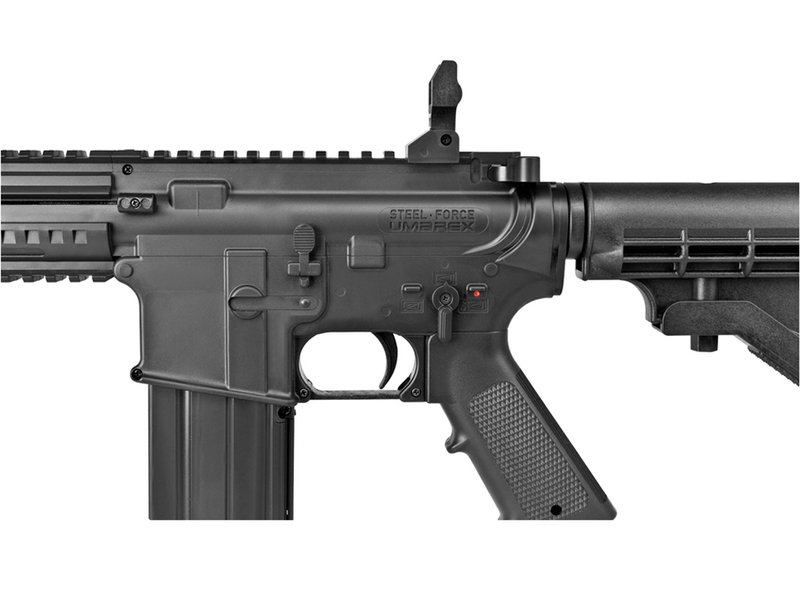 Comments: The Umarex Steel Force CO2 BB Machine Gun is for sure an improvement over the Steel Storm, first of all it is a true replica of a real rifle in production (The AR/M16 platform), it also has a rear stock that is adjustable which makes shooting this gun on target so much more easier. Overall I feel it shoots better than the Steel Storm with improved accuracy and performance. With that said the Steel Storm is still a great BB machine gun if you’re looking for more of a pistol SMG design. For the low cost of the Steel Force you really cannot go wrong, this BB machine gun will put a smile on your face every time you take it out to shoot it. I loved this BB gun. Looks great. Feels great. Shoots nicely. Easy to load. Inexpensive to operate. Will wow all your friends. Endles enjoyment, until....it breaks. Therein is the reason for the "1" rating. Simply poor manufacturing. Go to Amazon and read all the 1 or 2 or 3 star reviews. Everyone loved the gun, but always had a catastrophic failure. Normally the trigger goes dead. Almost always within the first 1000 rounds. When you call Umarex they seem uninterested other than asking you to ship it back to them if it is still in the 90 warranty period. Shipping USPS cost me $17. This gun would be a perfect "5" if they could just make it to last. Maybe someday. 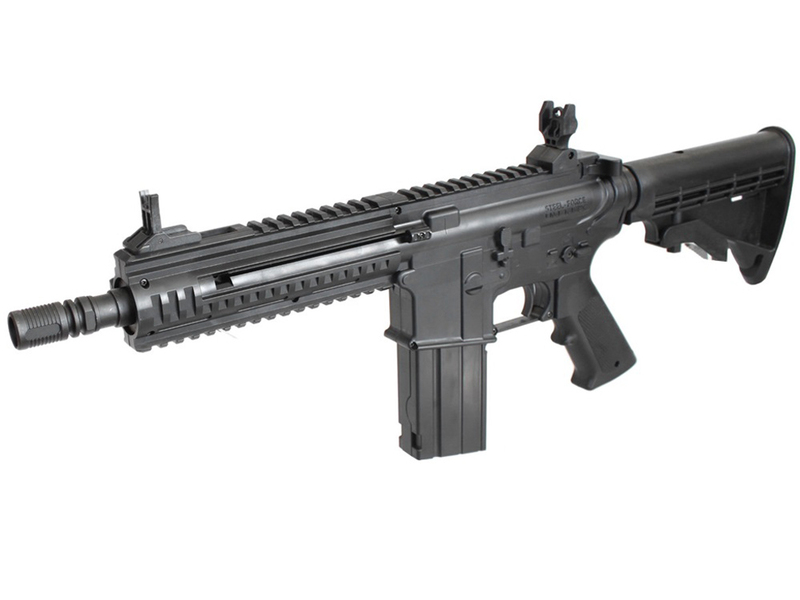 http://www.ReplicaAirguns.com - Umarex Steel Force CO2 Blowback BB Rifle Table Top Review. This video is a walkthrough review of the Umarex Steel Force (AR Replica) Blowback CO2 BB Rifle. I show off this BB machine gun close up from all angles and point out the plastic and metal parts, I also go through the features and benefits of this AR or M16 styled Replica. The Umarex Steel Force CO2 BB Machine Gun is for sure an improvement over the Steel Storm, first of all it is a true replica of a real rifle in production (The AR/M16 platform), it also has a rear stock that is adjustable which makes shooting this gun on target so much more easier. Overall I feel it shoots better than the Steel Storm with improved accuracy and performance. With that said the Steel Storm is still a great BB machine gun if your looking for more of a pistol SMG design. For the low cost of the Steel Force you really can not go wrong, this BB machine gun will put a smile on your face every time you take it out to shoot it. 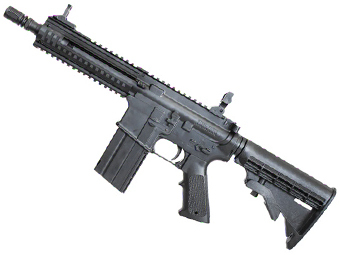 http://www.ReplicaAirguns.com - Umarex Steel Force CO2 Blowback BB Rifle Field Test Shooting Review. This video is a the Field Test or Shooting video for the Umarex Steel Force, I test out eh real works FPS using my Chronograph to see how hard it really shoots and I also take it back 30 feet and shoot the Steel Force in both semi auto and 6 round burst mode to see how accurate we can get using both shooting methods. Lastly I throw down some steel BB's at some unsuspecting water filled cans while recording with my high speed camera.